James Veitch Paterson (29th March 1934) won SAAA championship titles at 440 yards (1957 and 1958), 880 yards (1956 and 1957) and in the Two Miles Steeplechase (1953), ran a wonderful 1:47.5 for 800 metres and won the Crabbie Cup twice (1956 and 1957) and the Coronation Cup in 1956. He had a quite outstanding athletics career which was relatively short, ending when he graduated from Edinburgh University in 1958 and emigrated to Rhodesia. His small size relative to other half milers was almost always remarked on by by reporters and the phrase ‘deceptively frail’ was coined and used more than once. I’m not sure what it meant but probably just that he was not as big as the others! However even a quick look at his cross-country and road running performances show that there was nothing ‘frail’ about Jim Paterson. Although he was always a good runner and ran in several Edinburgh Southern Harriers squads that picked up medals in District relays and championships, and ran well in national cross-country championships, his career as an athlete really took off after he went up to Edinburgh University in 1953. We should certainly look at his running between 1951 and 1953 to start with. In winter 1950/51 Paterson ran in the Youths National Cross-Country Championships and finished fourth. As a Youth there were no early season relays for which he was eligible and the club did not have any representation in the District Cross-Country Championships. The following winter, 1951/52, as a first year Junior, he was eligible to run in the prestigious Edinburgh to Glasgow eight stage relay where he made his debut with the fastest time on the third stage of the team that finished fifth. He also moved the team from fourteenth to ninth – it was never easy to catch five teams in he E-G and to do it on your first ever run out, was quite a performance. In the East District Relay Championships in November 1952, , he ran for Edinburgh Southern Harriers on the third lap, handing over a lead of 21 seconds but his runner was caught by Dundee Hawkhill and ESH could only finish second. In the Edinburgh to Glasgow, Paterson ran the third stage again, and again had the fastest time when he brought the club from tenth to fourth. In the Championships, he finished ninth in the Edinburgh Southern team that took first place. He closed his season with a twenty third place for ESH in the Junior National. Distance runners typically start at the shorter end of their range, be it 220 yards, 440 yards or even 880 yards, and work up through the distances. Paterson, like Seb Coe, went in reverse. 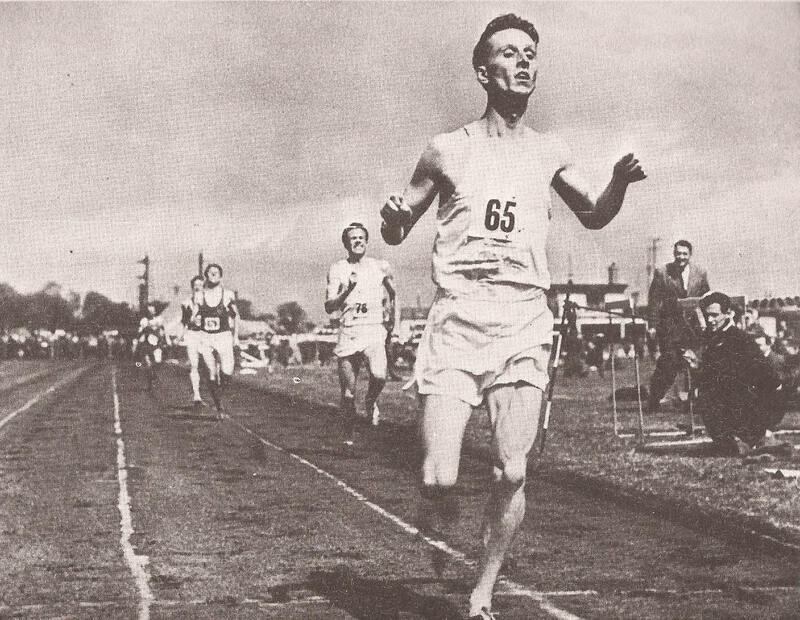 In 1953, as a student at Edinburgh University, he competed in the University track championships winning 440, 880 and Mile and being second in the 100 and 220 yards events in an afternoon and then a few days later he won the SAAA Two Miles Steeplechase Championship in in 10:37.6 which was a record time for the distance. His versatility was obvious to the wider athletics public at that point but he was to settle to the 440 and 880 yards events and it was in them that he was to find greatest success. At the start of winter 1953/54, in the East District Relays in November, Paterson ran on the final leg for the winning ESH team. Later in the month, in the Edinburgh to Glasgow, he set the fastest time on the first stage, beating Paisley Harriers home by three seconds. In the District Championships, he finished third – 65 seconds behind second placed, future team mate, Adrian Jackson with ESH also second team, behind the University squad, and he completed this winter with a fourth place in the Junior National. We might have expected a good track season after that build up, but in summer 1954 Paterson barely competed at all, missing from the programme for the Scottish Universities, inter-universities, inter-clubs, and SAAA championships. This was also the case in the cross-country season. Winter 1954/55 was a bit quieter than usual: he did not run in the relays or in the Edinburgh to Glasgow relay, but did run in the championship proper finishing eleventh and being third scoring runner for the University team that he would represent for the remainder of his career. He was not a runner in the national championships at the end of the winter. The situation changed right from the beginning of the 1955 season. There were mixed fortunes for him when he ran in Aberdeen at the Links Stadium on 23rd July in the Aberdeen Corporation meeting. He won the 880 yards in 1:553.6 which equalled the Scottish record and set a new ground record but that was balanced by finishing third in the 440 yards in which he and Bobby Quinn both started from scratch with D Martineau of Aberdeen (off 35 yards) splitting the rivals. He also gained a British Universities vest and a trip to San Sebastian for the World Student Games in which he was part of the winning 4 x 400 metres team and returned with a gold medal. In Winter 1955/56, Paterson made his first appearance in November at the East District Cross-Country Relays for Edinburgh University Hare & Hounds and was in the winning team with AS Jackson, AC Ross, and N Allsopp – not only that but he was second fastest man in the team (14:31) behind Adrian Jackson’s 14:07. In the Edinburgh to Glasgow in November 1955, he ran on the second stage for the University but it was not his best run and he dropped from seven to eleven. On 28th January 1956, on a foggy afternoon with difficult underfoot conditions, he finished third in the Championships at Dundee assisting his team to another victory. A 34th place in the national championships in 1956 closed the cross-country season and led into summer 1956. It was trhen into the next track season. At the Edinburgh to Glasgow University match at Westerlands on 5th May, 1956, Paterson had two first places: the first was when he won the 880 yards in a slow time of 1:03.7 and the second was as part of the winning 4 x 440 yards relay team. On 19th May in the Edinburgh University championships, he won the Donovan Cup after winning the 440 yards (49.6) and the 880 yards (1::57.5) which were both records. Into June and at the Scottish Universities championships at St Andrews Paterson again ‘did the double’ in 51.1 seconds and 1:58.7. But as you might expect, the ‘Scots Athlete’ had a lot more to say. This piece is from an article by James Logan in the issue of August ’56. “When he lined up for the quarter-mile final, Jim Paterson already had two fast ‘quarters’ and two fast ‘halfs’ in his legs, although in these days of high recovery rates, perhaps we shouldn’t count his Friday efforts! Title holder Quinn frustrated the ‘double’ bid by a superbly judged effort, especially commendable as he had to run ‘blind’ throughout the race. That brought his summer, 1956, to a close. It had been a pretty successful season which might have included a AAA’s medal had it not been for the incidents during the race which just cannot be prepared for. Into the competition year 1957/58 season and in November 1957, he ran the first stage for the winning team in the East District Relays with Adrian Jackson, Hunter Watson and Adrian Horne following on. In the E-G, he ran on the third stage, taking over from Adrian Jackson, and held on to third place for the team which eventually finished seventh. In the District Championships, he finished fifth and despite Adrian Jackson winning the race, ESH took the team title with four in the first ten and their last scorer 17th against the student team’s two in ten but three in the thirties. He did not run in the National in 1958. 4th May, 1957, was the date of the Glasgow University v Edinburgh University fixture and Paterson won the 440 in 50.4, the 880 in 1:55.8 and was a member of the successful relay team. A good start to the season. On 14th May in the Universities Championships at Reading, Donald Gorrie won the half-mile 1:54.2 with Paterson third in the 440 yards. On 1st June, championship month, Paterson won both 440 and 880 at the Scottish Universities championships in Aberdeen setting anew record din the 880 by over 3 seconds. His winning times were 49.8 seconds and 1:52.9. With regard to his range of talent, Emmet Farrell said in the May, 1957 issue of the Scots Athlete: “Most title holders and aspirants are quietly busy tuning up for the Scottish championships at Meadowbank in June and their form is not yet crystallised. One champion who is early in form is half mile holder Jim Paterson of Edinburgh University who has already set up marks of 1:52 for the half and 49.6 for the 440. Later he ran the half in 1:55.7, the 440 in 49.6 and the 220 in 22.9 seconds in one day. This isan amazing standard of versatility. One wonders what he might do if he did not dissipate his energies and concentrated on one event for a while. Perhaps the 4 minute mile might attract him and he could offer stern opposition to champion Everett. But after his great effort in last year’s AAA half mile championship, he would do well to concentrate on this distance.” A fortnight later in the Glasgow Police Sports he set the University relay team off to a winning start with a first stage timed at 1:52..4 for the half-mile. But again the ‘Scots Athlete’ covers the events and the man best – possibly because the writers did not have to meet a deadline to get copy from Friday and Saturday into the Monday paper, but nevertheless it provides detail and context to the performances. First of all Emmet Farrell in his ‘Running Commentary’. “Paterson has been one of our chief personalities because of his amazing versatility. Ex-steeplechase champion, once a competitor in a 15 mile road race, a competitor in five finals in the recent Edinburgh Varsity championship, 2nd in both sprints, a winner in 440, 880 and three miles. I doubt if anything like this has ever been seen in athletics, certainly not in Scottish athletics. His great double in quarter and half in Scottish championship best performances underline his class and must put him in the running for the Crabbie Cup (best competitor at the Scottish Championships.” The actual 1-2-3 in the events is interesting. 440 yards: 1. JV Paterson 48.6 sec; 2. J McIsaac (VPAAC) 49.1 sec; 3. D McDonald (Garscube) 50.6. Seven days later, 29th June, he travelled to Bordeaux as part of a small British squad and finished second to the American Arnie Sowell in the 800 metres in 1:47.5. This ranked him ninth in the world that year and took a massive 3.4 seconds from his previous Scottish record, set behind Mike Farrell at the Rangers Sports the previous year. Arnold Black and Colin Shields in their book “The Past Is a Foreign Country” point out that the Bordeaux time was was still in the top 20 Scottish all-time list in 2013, and that it stood until 1973 when David McMeekin ran only 0.1 seconds faster in a race at Leipzig. The next day, in the 400 metres, Paterson ran 47.9 which was the second fastest ever run by a Scot, the best being Liddell’s 47.6 in the Paris Olympics 33 years before. Paterson then went on to the World Student Games in Paris where, running for Great Britain, he won the 400 metres in 48.4 seconds and was a member of the 4 x 400 metres relay squad that finished second. He finished first in the 800 metres at Imatranskoski in Finland in 1:49.9 to end on a high note. The successful season was recognised by the SAAA who awarded him the Coronation Cup as the outstanding athlete of the year. In Winter 1957-58 the Edinburgh University team was without either Adrian Jackson or Jim Paterson in the relays and could only finish third. Hunter Watson ran the fourth and final leg in that relay. According to his diary, this event was held at Fernieside on 2 October 1957 and hge brought Edinburgh University from 4th to 3rd position by doing the sixth fastest time of 14:31, the fastest being 14:23 by Charlie Fraser of Edinburgh Eastern Harriers. He says, “My recollection is that when I took over for Edin. Univ. the team was so far behind that those ahead were out of sight. The change over was on the Fernieside track.” And there was no Jim Paterson in the Edinburgh to Glasgow in 1957 either. In the District Championships he was thirteenth for the team that finished second behind his old team, Edinburgh Southern. In 1958, he retained the 400 metres title in 49.0 seconds and finished second to Donnie McDonald of Garscube in the 880, the winning time being 1:54.5. The team for the British Empire Games was picked after the meeting and the quartet for the 440 was John McIsaac (VPAAC), Paterson, RL Hay (Edinburgh) and RH Thomson (Cambridge University), and for the 880 yards, Paterson, McDonald and Les Locke (London University). Unable to run in the championship, McIsaac had set a new Scottish record of 48 sec the previous week. Just looking through the team the quality all through is still evident with names like Everett, Binnie, Alastair Wood, Alan Gordon, and Hugo Fox. The squad named for the 4 x 440 consisted of the four for the 440 and the three for the 880 allowing the team management plenty of scope in selection once they saw how the men were running. In case there are any who have read this far and come to the conclusion that we are talking about a dour Scot, then the following article in the ‘Scots Athlete’ of March 1958 should disabuse them of the notion. There have been previous instances of Scottish athletes achieving championship status over a wide range but on the score of diversity James Veitch Paterson has surely earned himself a special place with SAAA titles at Two Miles Steeplechase, 880 yards and 440 yards. Nor does his versatility end there: in the period between these track exploits, he was prominent across the country – fourth in the 6 miles Junior title of 1954, behind such notable runners as John McLaren, Adrian Jackson and Andy Brown – and capable of a fast leg in road relay events. As a result of this wide range of activity, he can claim to have competed against most of Scotland’s leading runners, from sprinters up to marathon men, although not quite at the last named speciality. It would be reasonable to expect that his best distance to lie midway in his range, but so far he has directed his main effort at the 440 yards and 880 yards, frequently – as at the SAAA championships – aiming at ‘the double’ in one afternoon. In these events as he demonstrated in 1957 with with metric times of 47.9 and 1:47.5, he is already good enough to figure in world ranking lists. Nevertheless it will probably occur to many students of the sport that Paterson, at just over 5′ 7″ and 9 st 2 lbs, lacks the natural power to force himself to the very top at the shorter distance, and like another great lightweight, Wooderson (5′ 6″, 9st 2lbs) may yet find his greatest fame at the mile. It may be a pointer that a four-minute mile is among his ambitions. As a member of Edinburgh Southern Harriers, Paterson emerged as a likely distance prospect and was still in his teens when he won the SAAA Two Miles Steeplechase, in best championship time, in a tight finish which showed that he had fighting qualities in addition to talent. Later, in the colours of Edinburgh University, (he is an apprentice accountant, attending classes at the university) he began his well known double act of 440/880 in the track season, with a full round of cross-country competition in the winter. On the track he was not averse to the occasional ‘fling’ in the sprints: ‘mad keen to race’ is his own description of his extraordinary zest for competition. It will be obvious that enthusiasm of this order requires some regulation, if it is not to expand in all directions at once, and go up in smoke. Paterson gives all the credit for guidance to HAL Chapman and his father. In the period August 1956 to August 1957, Paterson based his preparation on a schedule planned by Tony Chapman. Before studying this, it should be appreciated that Paterson has the same difficulties as most other home athletes in adjusting his preparations to the demands of every day life. In his case there are further complications when examinations loom up. His normal lunch break is 12:30 till 2:00. If he uses this period to train – with a maximum of 45 minutes actually on the track – it means that his next normal meal after breakfast is at seven in the evening. If he trains after work, his evening meal is very late; if he goes home and has his meal at a reasonable hour, allowing reasonable time for digestion, he has to go out at a late hour for his training. He confesses that this last arrangement is a constant temptation to avoid training altogether. The problem, of course, is the lot of most of our athletes, and, short of creating anew privileged class, must be borne cheerfully. Apart from the difficulty of finding time, Paterson considers that the main flaw in his training is that he has to do the work alone. He finds that this causes him to train for shorter periods and at a faster rate than the schedule prescribes. Perhaps the desire for company also accounts for his extensive racing programme, which he regards as an essential part of his training, apart from its value in developing a competitive instinct. October – November: Steady running in the vicinity of his home. December: Complete rest from athletic training except weight training. January – February – March: General conditioning – mainly Fartlek about three times a week, each session lasting from one to two hours; and two sessions a week of weight training, each session lasting about an hour. Monday: Rest; Tuesday: Weight Training; Wednesday: Fartlek; Thursday: Weight training; Friday Rest; Saturday: Fartlek (or C-C race); Sunday: Fartlek. Monday: 50 minutes jogging on grass; Tuesday: 440 yards interval work on track; Wednesday: 50 minutes jogging on grass; Thursday: 220 yards interval work on track; Friday: Rest; Saturday: Run over country or rest; Sunday: 440 and 220 interval work on alternate weeks. Monday and Tuesday: As above; Wednesday: 30 minutes jogging on grass; Thursday: Fast/slow 150, 200, 330 yards (see below); Friday: Rest; Saturday: Race; Sunday: Race. All interval and fast/slow sessions, of course, began and ended with warming-up and down. The fast/slow programme was 150 yards, 150 yards flat out, 330 yards, 330 (39m, 45s), 200, 200 yards relaxed strides, with a 5 minute jog between each run, giving a total of about 45 minutes. The programme during the competitive season allowed for a Saturday race but there were many occasions when mid-week races caused adjustments. It will be seen from the progress table given below that this programme, varied sometimes according to circumstances or mood, brought notable improvements at all distances in 1957. Paterson also achieved the difficult 440/880 double at the SAAA’s championships, but Hallswell’s 49 year old quarter record of 48.4 secs eluded him. Jack Boyd (Glasgow University) – runner-up to Paterson at the SAAA – later deprived him of his native 880 record and the Edinburgh man can have no complaints on lack of home opposition to spur him on to greater performances. Paterson at 23 years of age is ready to make great sacrifices to fulfil his ambitions in what should be his best years . These ambitions include the recapture of the 880 yards record, a determined assault on Hallswell’s 440 figures, a four minute mile before 1960 and selection for the 1958 Empire and European Games and the 1960 Olympic Games. Final examinations and National Service calls may hamper his immediate plans, but he has the determination and resource to overcome these difficulties. We wish him well in his quest. The Scots in the 440 yards at British Empire Games, held in Cardiff between 15th and 28th July, had mixed fortunes. Only one made the final – John McIsaac was sixth with a time of 48.9 against the winner’s (Milka Singh, India) 46.6, while Paterson was sixth in his heat in a time of 48.6, Thomson was fourth in his in 48.8 and Hay was fifth in his heat in 49.9. In the 880 Les Locke was 7th in 1:54.7 against Herb Elliott’s 1:49.3, while the remaining Scots failed to make the final – Paterson was fourth in heat 2 in 1:54.4, Donnie McDonald was fourth in heat 1 in 1:54.6 and Graham Everett was third in heat 3 in 1:55.1. Maybe with some luck Paterson and his team mates could each have made the final but they would not have done anything as far as winning medals was concerned – guys like Elliott and Milka Singh were just too good. The result was not good enough to see him selected for the European Games. With only two per event being picked, the 400m places went to John Salisbury and John Wrighton, and the 800m to Derek Johnston and Mike Rawson. Only two Scots were selected – John McIsaac for the 4 x 400 relay and Crawford Fairbrother for the high jump. There was no appearance at the Rangers Sports on 2nd August either and Jim Paterson’s athletics career in Scotland was pretty well over. Graduating in 1958, he emigrated to Rhodesia where there was a lot of trouble with anti-colonial protests with white farmers and settlers being assaulted and murdered in their beds while they slept. “The Past Is A Foreign Country” tells us that Paterson protected his farmhouse with a machine gun from behind barbed wire emplacements using searchlights to illuminate his attackers.